Well, this is gorgeous. Even if all that evocative wailing initially reminded me of the start of The Exorcist when Father Merrin finds that relic in Iraq that looks like the demon Pazuzu. (But I digress.) This game is called Before, and it's the next project set to come out of Facepunch Studios, the developer best known for Garry's Mod and Rust. 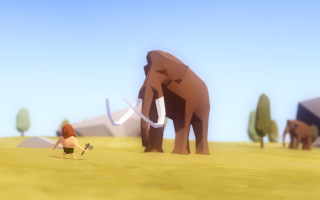 Bill Lowe, whose talents were acquired along with the game by Facepunch this September, presented the trailer for the caveman-'em-up at The Game Awards in Vegas. You can find out more about the making of the game on the team's dev blog here. It's definitely one to watch on the basis of this footage. Because, hey, adorable mammoths.